Did you know that we are an industry leader in direct marketing...and our proven techniques will put more money in your pockets? Our clients thrive on our efficiency! Give us a shot and watch your profits soar even more! by leaving the busy work to the professionals! We do it all! For more than 20 years, our proven proprietary marketing methods will get you the best bang for your buck and allow your foot to be the FIRST in the door!!! With our turn-key direct marketing services you receive the FASTEST design, print, postage, and mailing to TARGETED and VERIFIED single family homes for LESS THAN the cost of retail postage alone! That's right, we handle it all and send only to pre-selected homes with verified hail impacts under our proprietary swath technology... for less than it would cost you for the postage alone! This means you will get calls from qualified leads ONLY! No wasted mailings to apartment complexes, no calls from homes outside the drop-zone, and no wasted marketing dollars spent sending your hard-earned cash to these "time-wasters." 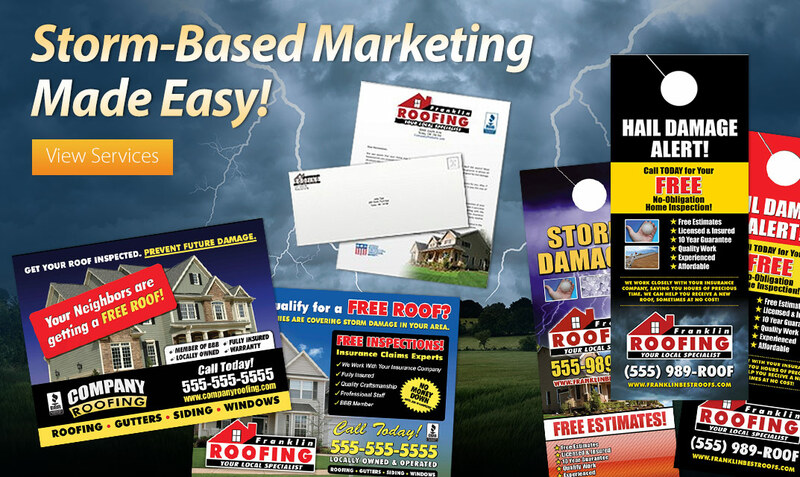 We make it easy for you to generate new customers in storm-impacted areas. We have over 50 postcard templates available and three card sizes to choose from so we can assist you in customizing a postcard mailer campaign to fit your needs and budget. to speak to a dedicated professional who will walk you through the process of turning your investment into profitable leads! Pricing includes everything from design, printing, addressing and postage! WHAT?!? Yes, for under $0.40/piece!!! Target areas based on your HailWATCH StormSWATH and our proprietary methods!